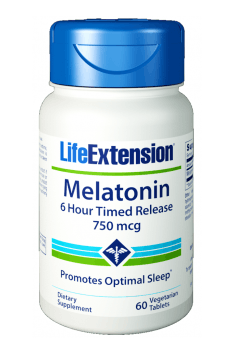 Life Extension Melatonin 6 Hour Timed Release is a dietary supplement that includes melatonin with a prolonged, 6-hour release. The preparation comes in the form of small, easy-to-swallow tablets. It is suitable for vegetarians. Melatonin is used mainly in the treatment of primary insomnia and sleep disorders. In addition, it has neuroprotective and antioxidant effects. It shows a positive effect on cognitive health and promotes the proper functions of the immune system. Melatonin (N-acetyl-5-methoxytryptamine) is a hormone released by the pineal gland. It is formed from tryptophan, which in the course of transformations is first transformed into serotonin and finally into melatonin. Thanks to its unique, lipophilic structure, it easily crosses biological barriers, including the blood-brain barrier that is not accessible for many compounds. The level of melatonin in the body is changeable – the highest at night and slightly lower during the day. In addition, it can be observed that melatonin synthesis decreases with age, which would explain common sleep problems in the elderly. Melatonin plays a key role in regulating the circadian rhythm of sleep and nocturnal vigilance. The production of melatonin intensifies in the evening and is a signal for the body that it is time for a night rest. People who function in the standard 24-hour rhythm, light - darkness, quickly fall asleep after taking melatonin, while the quality of their sleep gets also improves. The big advantage of prolonged-action of melatonin is that it allows maintenance of a proper level of this hormone throughout the night. This form of melatonin is the perfect solution for people who often wake up at night and cannot fall back asleep afterward. Supplementation with a properly selected dose does not only speed up falling asleep, but also promotes the continuity of sleep. Clinical and experimental studies show that melatonin is one of the most effective free radical neutralizers. The potency of its action is equal to the antioxidative power of vitamins C and E, recognized as the most powerful known antioxidants. In addition to scavenging oxygen radicals, hydroxyl radicals and hydrogen peroxides, it also stimulates the activity of compounds that form the endogenous system of the antioxidative system (glutathione, glutathione peroxidase, glutathione reductase, catalase). Removing excess free radicals from the body and eliminating oxidative stress is essential in the prevention of cancer and neurodegenerative diseases. It may also slow down the aging process. Melatonin has a beneficial effect on immunity. It works by means of various mechanisms. It contributes to the thymus volume increase and stimulates the activity of its cells, which promotes the proper production of T cells. In addition, it has an affinity for some orphan receptors, which also participate in the regulation of immunological processes. It may also balance the production of TNF-α, whose over-synthesis lies at the core of some autoimmune and cancerous diseases. The researchers suggest that the age-related decline in cognitive function may be associated with a decrease in the level of melatonin. Melatonin protects the brain against oxidative stress and the neurodegenerative processes typical for aging of the body. The positive effect of melatonin on the length and quality of sleep is also significant. In animal studies, it has been proved that sleep deprivation may cause degradation of some elements of synapses, which leads to disorders of cognitive function and mental abilities. In addition, lack of sleep promotes lowering of acetylcholine, which is crucial for good memory and intellectual performance. To sum up, Life Extension Melatonin 6 Hour Timed Release is a safe preparation that promotes proper sleep and well-being. It is ideally suited to people who have difficulties with falling asleep and maintaining sleep continuity. Supplementation may bring additional benefits in the form of strengthening immunity and improving cognitive functions. Take one tablet 30 to 60 minutes before bedtime, or as recommended by your healthcare practitioner. Melatonin is naturally secreted by the pineal gland at night, and should be taken at night for optimal results. The preparation is very effective in sleep disorders, especially if the problem are nocturnal awakenings and there are difficulties with maintaining sleep continuity. Melatonin is most often used in the evening. It causes drowsiness, therefore, after admission, you must not drive nor use machines or devices. You should also avoid tasks that require a lot of attention. It is recommended to take a break after 10-15 weeks of regular use of melatonin. Microcrystalline cellulose, hydroxypropyl methylcellulose, hydroxypropyl cellulose, aqueous film coating (purified water, hydroxypropyl methylcellulose, glycerin), stearic acid, vegetable stearate, croscarmellose sodium, silica.